If there’s one thing all booksellers search for, it’s the secret ingredient to a great turnout at every event, no matter how famous (or not) the author. We know people will have a great time when they come to an event; authors and books are fabulous, and authors invariably have great behind-the-scenes stories to share. The trick is competing with: nap times, soccer/baseball/insert-sport-here games, birthday parties, vacation travel, bad weather, good weather, school plays, music concerts, nearby festivals, forgetfulness, and general family mood on the day of the event. But this past Sunday, we found a foolproof, absolutely irresistible lure for any author event. And here it is: Add a lamb. Really. 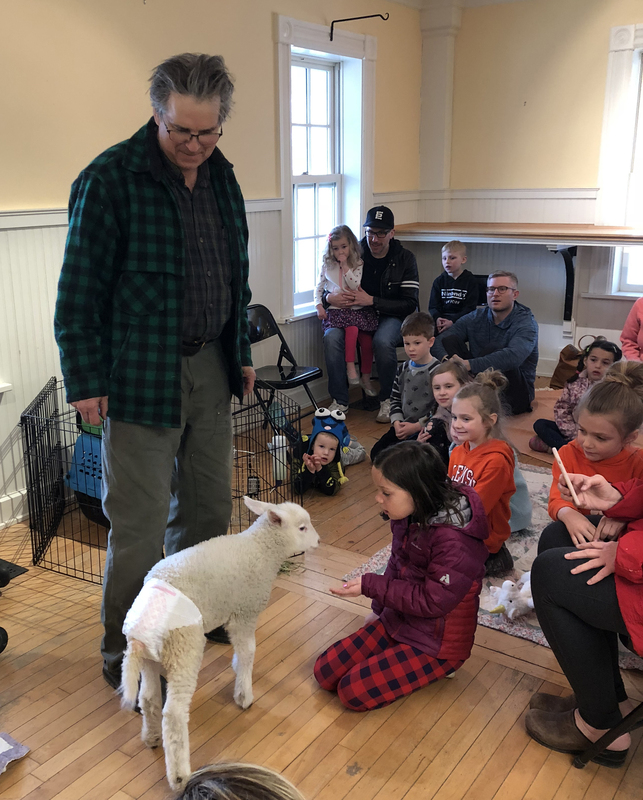 If you feature a live, diapered, soft little lamb with your event, you will bring hordes of people to your store who have never been there before. Who have never, perhaps, attended an author event in their lives but leave swearing they’ll come to every event you ever plan in the future. It’s a fact. 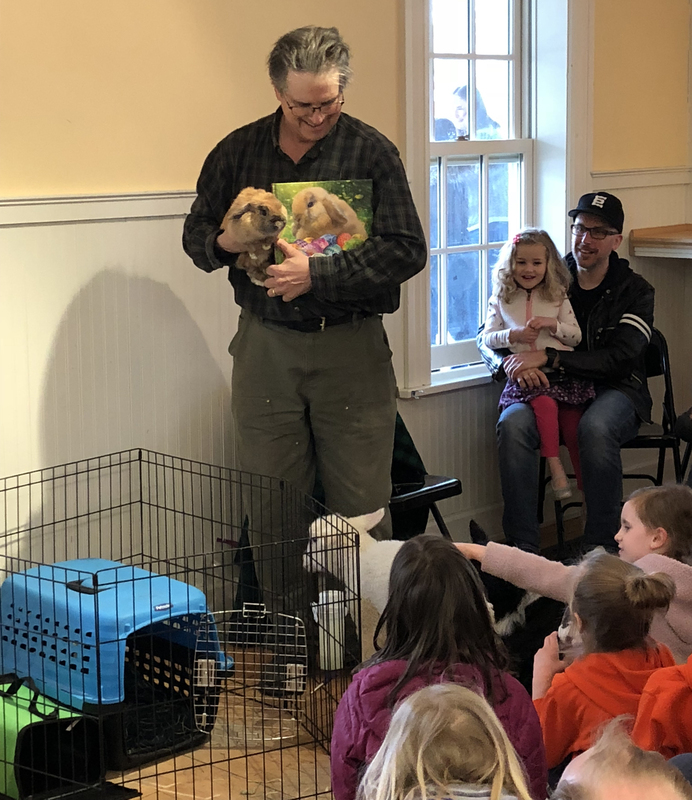 On Sunday, Vermont photographer and hobby farmer John Churchman came to the Flying Pig to celebrate his newest book, The Easter Surprise. He brought Moonbeam the lamb, Fern the Bunny, and Laddie the border collie with him, and it was magical. We used a large space next door to the store that fits about 80 people at a time more or less comfortably. Moonbeam the lamb meets a little girl. Farmer John holds Fern next to her book cover. Moonbeam guards Farmer John during his reading. There were no tears, no shrieks, no frightened animals. 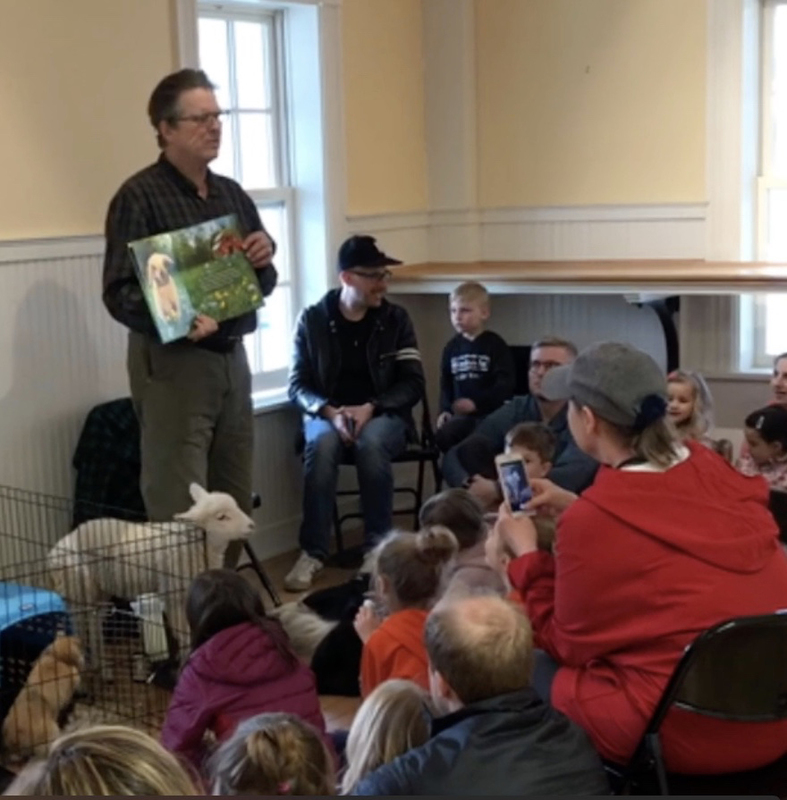 That’s a big win for any children’s event, and we credit Farmer John’s gentle calm with creating the perfect tone to keep children happy, calm, and gentle themselves. So, authors? Even if your book doesn’t include a single animal, I highly recommend you add a lamb to your presentation. You’re a writer; I’m sure you can figure out how to justify it. This entry was posted in Uncategorized on April 16, 2019 by Elizabeth Bluemle.